Miniature purple iris vase by Veronique Cornish for your dollhouse. Dimensions 9/16" opening x 1-3/8" tall. Miniature cherub planter by Veronique Cornish for your dollhouse. Dimensions 3/4" diameter x 1-1/8" tall. Miniature five birds perching on a vase by Veronique Cornish for your dollhouse. Dimensions 1" diameter x 3/4" tall. 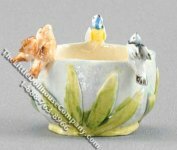 Miniature four birds perching on a vase by Veronique Cornish for your dollhouse. Dimensions 1" diameter x 3/4" tall. Miniature hallow tree three opening vase by Veronique Cornish for your dollhouse. Dimensions 1-1/8" long x 1/2" wide x 1-1/2" tall. 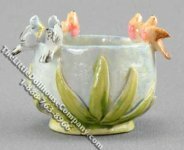 Miniature white lily of the valley vase by Veronique Cornish for your dollhouse. Dimensions 5/8 opening x 1-1/4" tall.